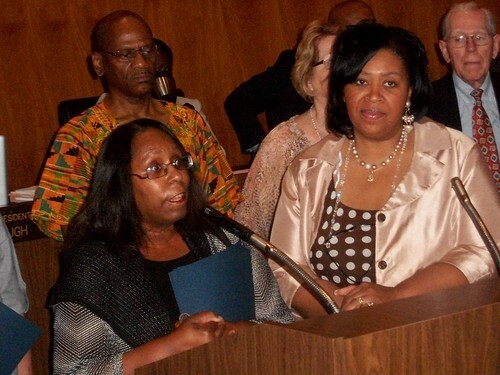 Belva Davis of the Detroit Dominican's Literacy Program receiving an award from City Councilwoman Brenda Jones at the City Council auditorium on June 21, 2011. (Photo: Abayomi Azikiwe), a photo by Pan-African News Wire File Photos on Flickr. Detroit— Next month’s election for City Council president may decide how cooperative or combative the panel will be with Emergency Manager Kevyn Orr. Re-elected Councilwoman Saunteel Jenkins has held the presidency since July and is being challenged by fellow at-large colleague Brenda Jones, who won the most votes in the Nov. 5 election. The council’s decision-making powers have been limited since the March arrival of Orr. Council members have been restricted to passing minor laws and being given a chance to weigh in on some emergency manager proposals that are ultimately decided by the state’s emergency loan board. A critic of the lack of transparency from Orr and the city’s restructuring team, Jones said she believes Orr and Mayor-elect Mike Duggan “are sincere about working together.” She said her breadth of experience serving on most council committees will help the council and city move forward. Detroit political consultant Steve Hood said Jenkins would keep the “status quo” while Jones potentially could be “more combative” with the emergency manager. The Jones-Jenkins race will likely come down to vision, since both have “natural bases of support,” said political consultant Eric Foster. Jenkins, a social worker who held jobs in the nonprofit sector, has strong ties to the business community. Jones, a former local president of Communication Workers of America, is deeply rooted with unions. “Both will have to lay out a business case of ‘why me,’” Foster said. Complicating the contest is District 2 Councilman George Cushingberry Jr., who is also evaluating a run at the presidency.Cushingberry formed an exploratory committee and commissioned an online poll and fundraiser, according to social media. The former state representative and Wayne County commissioner or anyone associated with his committee could be reached for comment. The different approaches of Jones and Jenkins were reflected in the council’s debate about Orr’s agreement with Gov. Rick Snyder on a 30-year lease for the state to operate and improve Belle Isle park. Jenkins moved fast to persuade the council to counter with a 10-year lease plan and other conditions to ensure protections for the city. Jones was unrelenting in her position against the lease, voting against both plans, while calling Orr’s agreement “a crime to this city.” The loan board — composed of three Snyder appointees — ultimately rejected the council’s alternative proposal. The leadership issue will be decided at the council’s Jan. 6 meeting, when five new members join four incumbents at the table. A president and president pro tem will be selected by a majority vote of the members. In the past, those positions were determined by which council members received the highest and second highest number of votes in the last election. Under Detroit’s new City Charter, voters elected two at-large members and seven by district for the first time in nearly 100 years. “This (new charter) gives us a little bit more power and allows us to pick somebody who we think can do the best in terms of looking toward the future of Detroit,” incoming Councilman Gabe Leland said of the upcoming election of the council’s leadership. Jenkins, first elected in 2009, became president following the abrupt departure of Charles Pugh, who left City Hall this year amid a failed request for medical leave and allegations of an inappropriate relationship with a teen boy. “I came into the president’s office under some really difficult circumstances, and I’ve managed to make it work,” she said, noting she was able to implement the council’s new budget in short order. Jones, during the incoming council’s swearing-in ceremony at Wayne State University earlier this month, said her experience and cooperative spirit make her the right choice. The council president presides over all regular sessions, appoints chairpersons for committees and handles the council’s administrative budget and staff. Incoming Councilman Scott Benson said the decision is one of the first the new council will make and sets a tone. Push for Cush!!! He would be a perfect Pesident!!! He's fair and Firm!!! I would move back to Detroit if he's elected Pesident of the Council!!! !